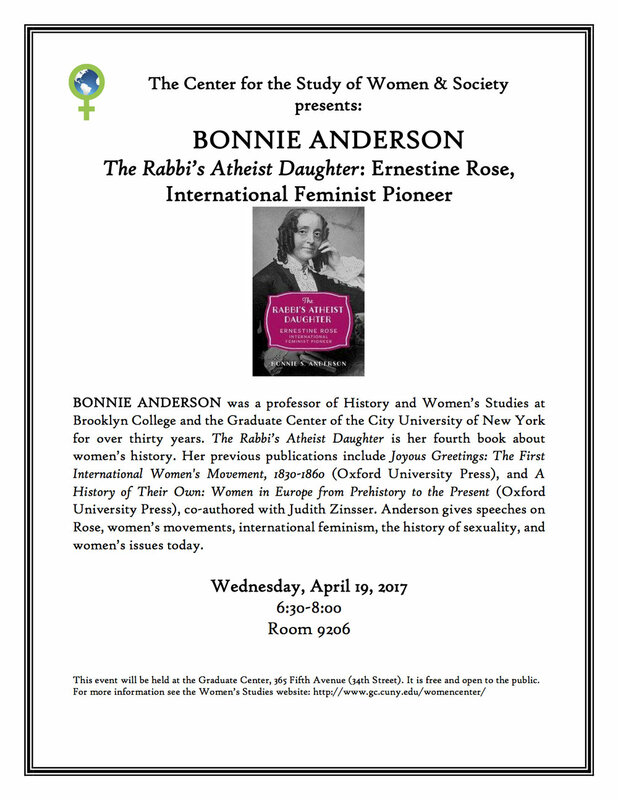 I'll be speaking on Ernestine Rose in Van Dyke Hall, Room 301 on the Rutgers New Brunswick campus. There will be a meeting with graduate students first and a reception afterwards. This event is free. I'll be speaking here on Monday, June 5 at this free event. The exact address is 67-09 108th St. Books will be sold at this event and of course I'll autograph them. Some books will be available for sale and if you bring a copy of course I will autograph it. Books can be ordered from my website, bonnieanderson.com. A panel on the mobilization of Jewish women throughout U.S. history, chaired by Bari Weiss of The Wall Street Journal and including Lynn Povich, author of The Good Girls Revolt, Rebecca Traister, author of All the Single Ladies, and Bonnie Anderson, author of The Rabbi's Atheist Daughter. Books will be available for sale. CUNY Graduate Center Talk CANCELLED! Due to the impending blizzard, the Graduate Center will be closed on March 14th. The talk will be rescheduled and I will post the new date as soon as I have it. A free event, hosted by the Women's Studies Program in Room 9205. The Graduate Center is on the east of Fifth Avenue between 34th and 35th streets. I will be speaking about my book. A limited number of books will be available for sale, but you can also buy it ahead of time and I will be happy to autograph it. I'll be speaking about Ernestine Rose at this library on Saturday, March 11 at this free event. The exact address is 108-19 71st Avenue. Books cannot be sold there, but if you have a copy and bring it, I'll be happy to autograph it. Today is the official publication date of The Rabbi's Atheist Daughter by Bonnie Anderson! You can order the book from December 1 on, which is the release date. More information about the book here.